Oesterr. Bot. Z. 8: 180. 1858. TYPE: Costa Rica, near Naranjo, Oersted s.n. 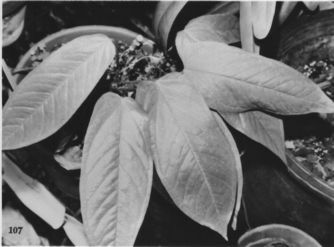 (Type not found; Photo of Schott Aroid Drawing #322, NYBG Neg. #N.S. 3812). Anthurium porrectum Schott, Oesterr. Bot. Z. 8: 180. 1858. TYPE: Costa Rica, near Desengano, Wendland841 (GOET). Anthurium lapinostachyum Schott, Oesterr. Bot. Z. 8: 180. 1858. TYPE: Costa Rica, near Candelaria, Alto de La Cruz, Hoffmann s.n. (Photo of Schott Aroid Drawing #331, NYBG Neg. #N.S. 3818). Anthurium colombianum Engl., Bot. Jahrb. Sysi. 25: 379. 1898. TYPE: Colombia. Putomayo: valley of Sibundov near Santiago, E of Pasto, cicv. 2,000-2,500 m.
Anthurium tuerckheimii Engl., Bot. Jahrb. Syst. 25: 380. 1898. TYPE: Guatemala. Alta Verapaz: Pansamala, 1,200 m, Tuerckheim 864 (B, holotype; K, US, isotypes). Anthurium gracilescens Sodiro, Anales Univ. Centr. Ecuador 15: 393. 1902. TYPE: Ecuador. Pichincha: Nanegal, Sodiro s.n. (B). Anthurium lepturum Sodiro, Anales Univ. Centr. Ecuador 15: 458. 1902. TYPE: Ecuador. Pichincha: western slopes of Volcán Pichincha, Sodiro s.n. (B). Anthurium nanegalense Sodiro, Anales Univ. Centr. Ecuador 15: 460. 1902. TYPE: Ecuador. Pichincha: Gualea, Sodiro s.n. (B). Anthurium silvalicum Sodiro, Anales Univ. Centr. Ecuador 22: 25. 1907. TYPE: Ecuador. Tungurahua, Sodiro s.n. Anthurium barbanum K. Krause, Notizbl. Bot. Gart. Berlin-Dahlem 9: 270. 1925. TYPE: Costa Rica. Near Barba, A. C. Brade 2510 (B). 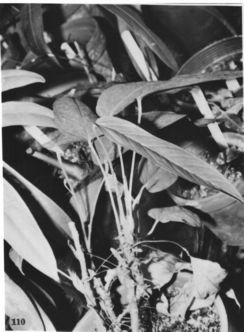 Anthurium gracilens Standl., Publ. Field Mus. Nat. Hist., Bot. Ser. 22: 68. 1940. TYPE: Panama. Chiriquí: Río Chiriquí Vicjo Valley, 1,300-2,000 m, White 160 (F, holotype; MO, isotypes). Scandent epiphyte or semierect, terrestrial herb; stems elongate, frequently to 1 m or more long, 4-7 mm diam., sparsely long-rooted at the nodes; the inlernodes (0.6)1-8(1 1) cm long; cataphylls thin, 4.5-7.5(11) cm long, acute and apiculate at apex. promptly weathering, soon deciduous, sometimes with a few pale fibers persisting. LEAVES persisting at the upper 6-10 or so nodes; petioles erect-spreading, subterete, narrowly and shallowly sulcatc, 5-16(24) cm long, 2-2.3 mm diam. ; geniculum 5-10 mm long; blades usually ± oblong, sometimes lanceolate, narrowly oblong-elliptic or oblong-ovate, abruptly or gradually acuminate at apex, usually truncate to rounded at base, sometimes acute or subcordate, 9-25 cm long, 2.5-1 1 cm wide, moderately thin: the upper surface semiglossy; midrib raised in a valley above, diminished and sunken toward the apex, prominently raised below; primary lateral veins 4-11 per side, departing midrib at ca. 45° angle, sunken above, raised below, straight or slightly curving to collective vein; interprimary veins usually present; tertiary veins usually prominent on lower surface; basal veins 1-3 pairs, usually free at base, all but the uppermost soon joining the margin; collective vein arising from the first basal vein, 2-5 mm from the margin. INFLORESCENCE erect, shorter than the leaves; peduncle terete, 5-15 cm long; spathe lanceolate-elliptic, olive-green or pale green, sometimes tinged purplish, 3-4(5) cm long, to 1.7 cm wide, abruptly acuminate at apex, weakly cordate at base, inserted at 45°-50° angle on peduncle; stipe usually 2-5 mm long, sometimes absent, or to 10 mm long; spadix pale yellow to yellow-green or green, sometimes tinged with purple, 1.5-4 cm long at anthesis, usually 4-5 mm diam. near base, 3-3.5 mm diam. near the apex; flowers square to weakly 4-lobed, 2.5-3 mm wide in both directions, the sides straight tojaggedly sigmoid; 4-6 flowers visible in the principal spiral, 6-7 flowers visible in the alternate spiral; tepals semiglossy, minutely papillate, large nectar droplets scattered over the surface when anthers are emerging, lateral tepals 1.5-2 mm wide, the inner margin broadly convex; pistil weakly emergent, medium green, slightly darker than tepals, semiglossy; stigma colorless, raised, brushlike, ca. 0.5 mm long, with stigmatic droplets 1 -3 days before anthers emerge; stamens emerging slowly from the base, the laterals preceding the third and fourth stamens by only a few spirals; anthers cream, inclined over pistil, ca. 0.5 mm long, ca. 0.8 mm wide; thecae ovate-elliptic, slightly divaricate; pollen creamy white. INFRUCTESCENCE with spadix to 8 cm long, to 2.5 cm diam. ; berries yellowish-green, subglobose, ca. 5 mm diam. Figs. 107and 110. The species ranges from Mexico to Ecuador at elevations from 800 to 2,300 m in premontane rain, lower montane wet, and lower montane rain forest. It is one of the most variable species of Anthurium in North America. In Panama it is most easily confused with A. pallens (see that species for a discussion of the differences). In South America it is apparently closely related to A. amoenum Kunth in Peru and Bolivia, A. tenuicaule Engl., and A. brachypodum Sodiro from Ecuador. Sodiro described several species based on the presence or absence of a stipe, the comparative lengths of the peduncle and petioles, and the shape and relative si/e of the spathe in relation to the length of the spadix. These characters have been observed to be too variable even within a single population to warrant their use in the separation of species. Anthurium microspadix has been placed in section Xialophyllium. Mention should be made of an error in the translation of Lehmann's handwritten label by Engler. The type locality should read "Sibundoy" rather than "Dibundog."